It is the time of year when I just can’t get enough gingerbread flavored treats. As I mentioned earlier this week, I absolutely love the flavors in gingerbread treats. I came across this recipe earlier this fall and just could not wait for this time of year to make them. These cookies are out of this world fantastic! They are unbelievably soft and chewy and I love soft and chewy cookies! They are the perfect soft and chewy ginger cookie with the added bonus of chocolate chips. I am already on my second batch of these because they are that good! The second time around I used mini chocolate chips and I think they are a wonderful choice for this cookie as you just get sweet little nibbles of chocolate with each bite of the spicy ginger cookie. 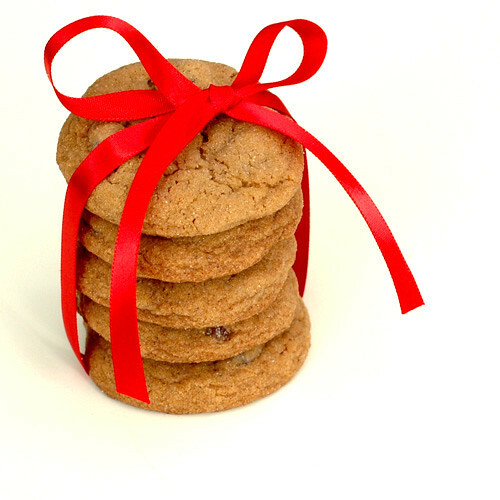 Stay tuned as I have one more yummy gingerbread flavored treat coming later this week. Hope everyone is having a wonderful Christmas season! Position a rack in the middle of the oven. Preheat the oven to 350 degrees F. Line two baking sheets with parchment paper or just spray lightly with cooking spray. Sift the flour, baking soda, spices and salt into a medium bowl and set aside. In a large bowl, using an electric mixer on medium speed, beat the butter and brown sugar until smoothly blended, about 2 minutes. Stop the mixer and scrape the sides of the bowl as needed during mixing. Add the egg and molasses and mix until blended and an even light color, about 1 minute. On low speed, add the flour mixture, mixing just to incorporate it. Fold in the chocolate chips. Spread the granulated sugar into a small bowl. Roll a heaping tablespoon of dough between the palms of your hands into a ball, toss the ball in sugar to coat and place on the prepared baking sheet. Continue making cookies, spacing them about 2 inches apart. Bake the cookies one sheet at a time until the tops feel firm but they are still soft in the center and there are several large cracks on top, about 12-14 minutes. Cool the cookies on the baking sheet for 5 minutes, then use a wide metal spatula to transfer the cookies to a wire rack to cool completely. Here I go with another pumpkin recipe! There is a local grocery store that sells these pumpkin chocolate chip cookies that I just LOVE. I thought how great would it be to have those same flavors in a muffin. So I found this pumpkin muffin recipe and I added the chocolate and made them bite sized mini muffins. I took these with us camping this last weekend and they were the perfect little muffin to just snack on with a big cup of coffee while we waited for the huge breakfast spread to be made. They also make a wonderful little snack just about any time of the day. These were very tasty little muffins! Preheat oven to 400 degrees. Generously grease 1 mini muffin tins.Sift flour, sugar, baking powder, cinnamon, ginger, nutmeg, and salt. Cut in butter with two knives or a pastry blender until it is fully incorporated. In a separate bowl, mix together pumpkin, evaporated milk, egg, and vanilla. Pour pumpkin mixture into the flour mixture. Add mini chocolate chips. 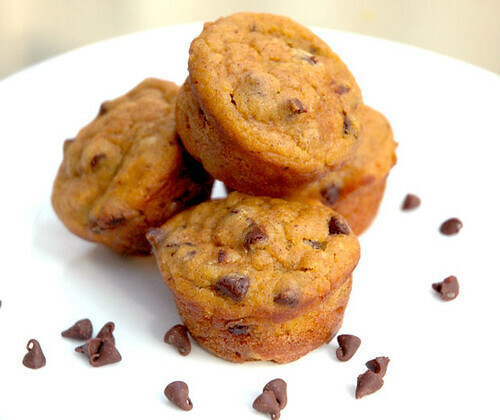 Fold gently until mixture is just combined.Pour into a greased muffin pan. Bake for 25 minutes. Allow to cool in pan for 15 minutes, then remove and allow to cool.